Large & small victories in the fight for equal access to creating our technological future. Working dance sleeve (photo by the author). 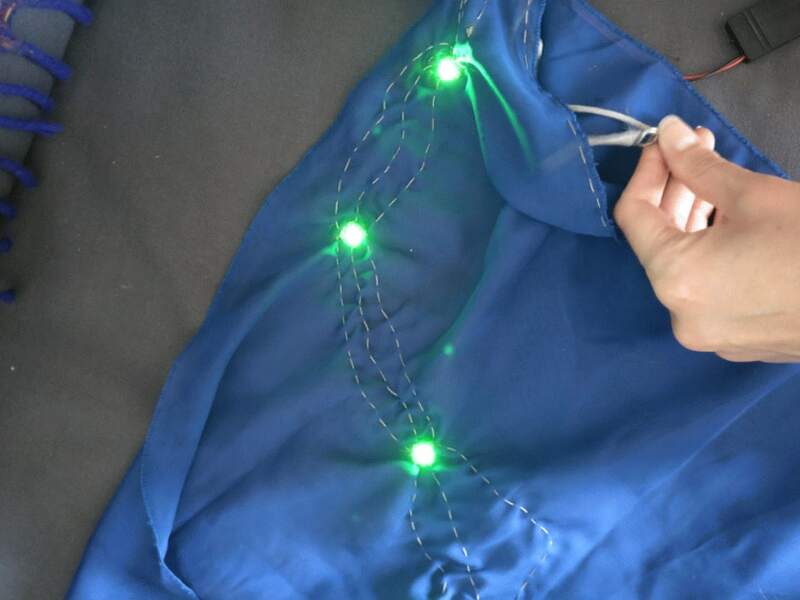 This weekend I celebrated the successful completion of my first-ever Arduino-powered project, a dance costume sleeve that changes colour as the dancer moves. This weekend I also found out that the Afghani competitors in this year's FIRST Global robotics competition, a team of six young women, were at last granted permission to enter the United States in order to join their robot for the competition. As I finished up my irreverent electrically powered sleeve I thought about all the challenges I faced in the course of creating this project: struggling to get the Arduino IDE working correctly; setting my project on fire more than once with a short circuit; a faulty battery holder which provided no power. It took me five months to make the finished product. I also thought about the extensive support and privileges I have: attending a free Gemma workshop earlier this year enabling me to learn how to work with these sewable microchips. Time and leisure to dream up and carry out projects like this. The unwavering support of my friends, family, and the internet at large, who gave me tools, encouragement, and advice when the going got sticky. I remember first seeing the news that the all-girl robotics team from Afghanistan had been denied visas to attend the FIRST Global competition (though their robot would be allowed to go without them); my sense of frustration and helplessness at the inequality in the world. All my little annoyances in creating my first Arduino project were as nothing to the challenges--and the dangers--these young women faced on their road to the robotics competition; my pride in the culmination of my creative efforts felt meaningless when these talented young women were prevented from showing the world what they can do. When I read that the girls will be able to complete their technological journey in the next few days by joining the competition, I couldn't help feeling a personal sense of joy and hope. Moments like these are the key to inspiring the world to rethink assumptions about who is and who is not technical. On their competition page, the girls wrote: "most breakthroughs in science, technology and other industries normally start with the dream of a child to do something great." I think dreaming to do something great and having the agency to realise those dreams is the most revolutionary force that humanity has. Humble as my first Arduino project is, the story of these girls is a clarion call to me to keep growing my technical skills, to persevere with increasingly complex challenges and to work towards creating something truly wondrous. Their story also spurs me on to continue to advocate for greater diversity in technology. I was heartened by the outpouring of support from all around the world advocating for these young women to attend the competition in person. Reading about the group of Afghan-American teens who volunteered to take the ball-sorting robot to the competition on the girls' behalf if they were not able to go, I thought about what a powerful force collective action can be for calling out inequality and ultimately for creating change. Author William Gibson is oft-quoted as saying "The future is here--it's just not very evenly distributed." In a time when globally we face an ever-increasing divide between those who have access to building our technological future and those who do not, it is gratifying and inspiring to see people around the world work together on making opportunities for everyone to be a part of creating that future. In the words of FIRST Global President Joe Sestak, "“I truly believe our greatest power is the power to convene nations, to bring people together in the pursuit of a common goal and prove that our similarities greatly outweigh our differences."